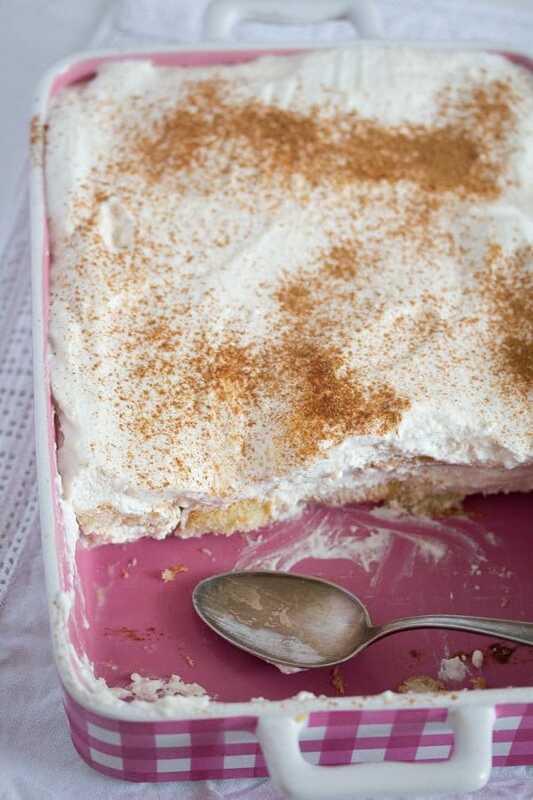 Creamy and delicious apple tiramisu. 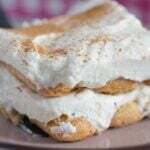 A wonderful applesauce dessert with ladyfingers, mascarpone, cinnamon and cream. I have made 12 jars of applesauce last week. And I could make at least 30 more, but there is no way I can find more room for the jars in my freezer. I don’t even have an apple tree, but I received so many apples from all over the place that my cellar is already full. I am actually afraid we will not be able to use all the apples before they start going bad. 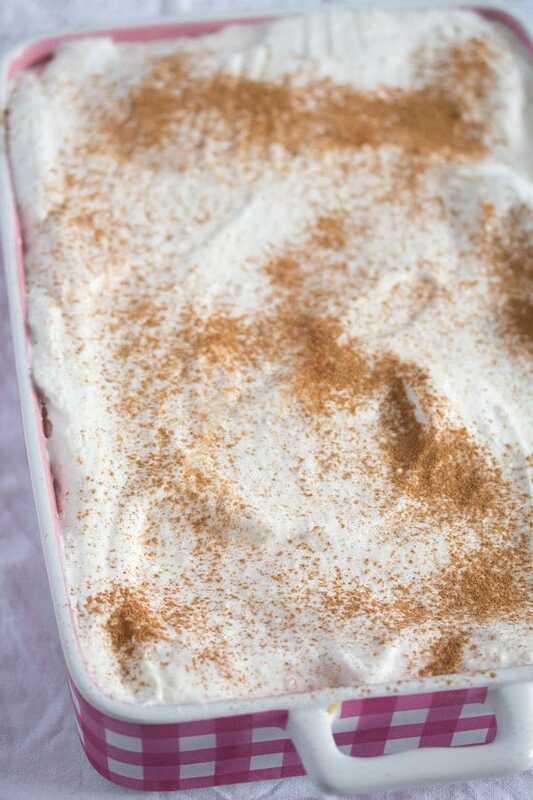 So, I have been making tons of applesauce, apple cakes, apple pies, apple muffins and apple desserts, like this apple cinnamon dessert or apple tiramisu. I have even used apples in my cooking, we had some great savory apple dishes these days, something like this vegan apple curry, for instance. This apple tiramisu or applesauce dessert is one of the first recipes I have ever posted on Where Is My Spoon. The photographs I used to take 4 years ago were terrible, so I’ve just thought it to be high time to renew the photographs and the text of the blog post as well. After all, I have been making this wonderful apple cinnamon dessert at least once or twice every year since posting the apple tiramisu recipe for the first time. 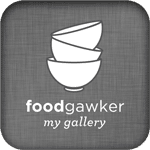 It is really an exquisite applesauce dessert, a great way of using some of the many jars of applesauce I cook every year. Not to mention that my son Bruno is the biggest applesauce fan there is and is always thrilled when I am making any kind of applesauce dessert. I use homemade applesauce most of the times, because I always seem to have a jar or two in the fridge or in the freezer. However, rest assured that you can definitely make this apple tiramisu using bought applesauce. I only think that homemade applesauce tastes a bit better, but that is always the case with any kind of homemade sauces or jams or whatever. Homemade is always better. Otherwise, the consistency of homemade applesauce and what I can buy in the store is pretty much the same. I would not choose a very sweet store bought variety, actually if you could find unsweetened applesauce would be best. My homemade applesauce is rather tart and that is the way we like it best. Sweetened store bought applesauce tends to be too sweet for me, that is why if I used that I would start with less sugar in the mascarpone applesauce mixture and only add more sugar after tasting the mixture, if necessary. Of course, if you would like the dessert to be sweeter than this, just add a bit more sugar and make it just the way you want it. This is an easy, forgiving recipe, you don’t have to be exact. This is not a cake, so exact measurements are quite unnecessary. If you happen to have only 200 ml cream instead of a whole cup is fine, if you add a bit more applesauce or sugar is fine as well. Also you could add more cinnamon or lemon juice to suit your taste. Start by beating the heavy cream until stiff peaks form. Set it aside. Mix the mascarpone shortly to help it become smoother, but don’t overdo it. I find that if you beat mascarpone too long it will become runny and that would not be suitable for this apple cinnamon dessert. Once the mascarpone is less stiff, fold in the applesauce and the sugar. If using sweetened applesauce, add less sugar at first, incorporate it well, taste the mixture and add more sugar to taste. 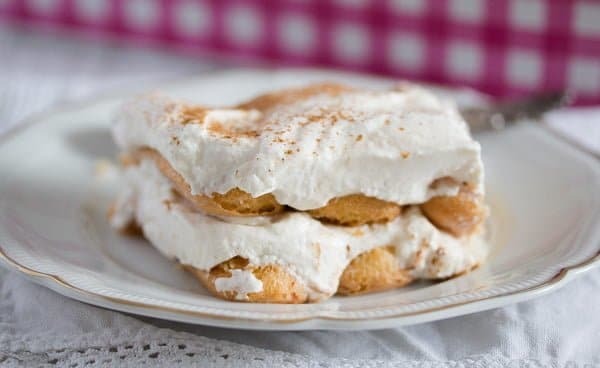 Just keep in mind that the ladyfingers are very sweet as well and a less sweet mascarpone applesauce mixture would balance that sweetness a little. Add the cinnamon and the freshly squeezed lemon juice, stir well, taste again and add more cinnamon or lemon juice if you find it necessary. Place half of the ladyfingers into a rectangular glass or ceramic casserole dish. My dish measures 30×22 cm/ 12×9 inches. But that is really not to be followed exactly. If your casserole dish is a bit larger or a bit smaller it will be OK, use as many ladyfingers as they fit in the dish in a single layer. Sprinkle the ladyfingers in the casserole dish with half of the milk which you have previously mixed with cinnamon. 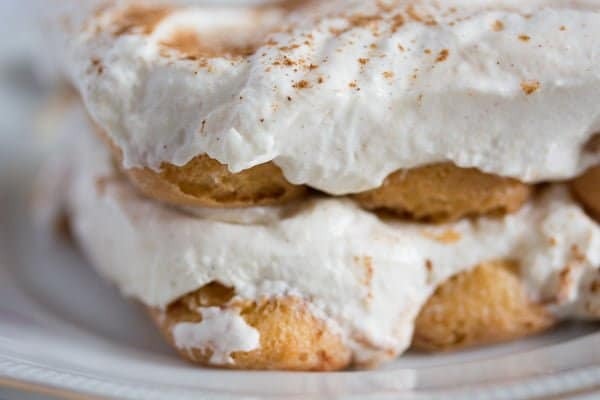 Top the soaked ladyfingers with half of the mascarpone applesauce mixture, cover this mixture with the remaining ladyfingers and sprinkle those with the remaining cinnamon milk. Cover the casserole dish with cling film and refrigerate for several hours, preferably overnight. Sprinkle the applesauce dessert with more cinnamon and some crushed ladyfingers (if you happen to have one or two leftover, if not, it’s OK) just before serving. 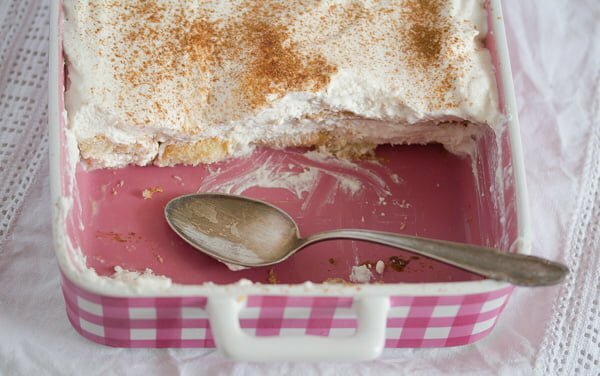 The apple cinnamon dessert or apple tiramisu keeps well in the fridge for at least two days. Whip the heavy cream until stiff. Mix the mascarpone until smooth, but don't overdo it or it will become too runny. Fold in the applesauce, sugar, ½ teaspoon cinnamon and lemon juice. Fold in the whipped cream carefully. Place half of the ladyfingers into a rectangular dish of about 30x20 cm/ 12x8 inches, a bit larger or smaller is OK. Mix the milk and the remaining ½ teaspoon cinnamon together and sprinkle half of this mixture over the ladyfingers. 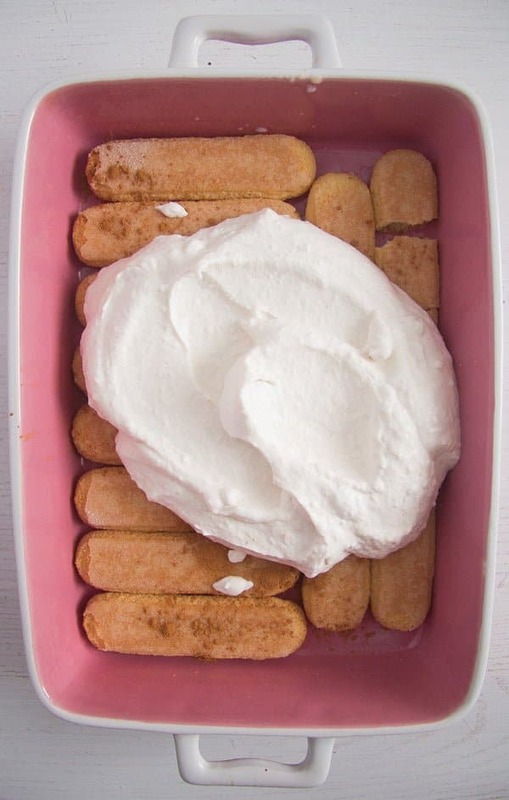 Spread half of the applesauce mascarpone mixture on top and add the rest of the ladyfingers. Sprinkle them with the rest of the milk and add the remaining applesauce mascarpone mixture over them. Cover the casserole dish with cling film and place the apple tiramisu in the fridge. Leave it overnight. Sprinkle with some more cinnamon and one or two crushed ladyfingers before serving. Note 1: I use homemade applesauce, which is rather tart. If buying applesauce try to find an unsweetened sort or at least one that is not overly sweet. 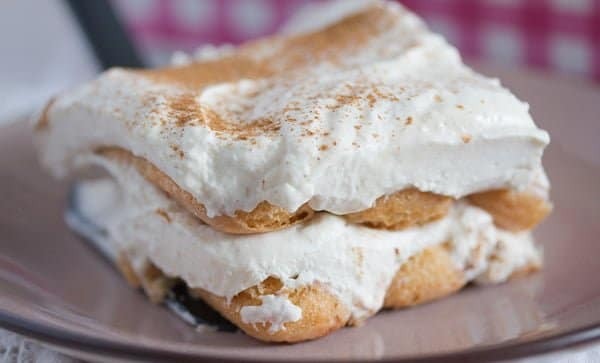 If the applesauce is very sweet, add less sugar to the mascarpone applesauce mixture and increase the quantity only after tasting and only if absolutely necessary (keep in mind that the ladyfingers are very sweet as well). Note 2: According to the size of your casserole dish use more or less ladyfingers as required to fill the dish. This sounds really delightful. It’s also lovely that you have a lot of apples from friends. It looks like a wonderful dessert! Tiramishu is my all time favorite dessert you know 🙂 how are you btw?? What a delicious sounding fall dessert.